A couple of Mondays per month, PlayGroundology screenshots a cyberspot that focuses on playgrounds, or play. I hope readers dive in and explore. Even if you’ve seen the selection before, take a moment and check to see what content has been added recently. Think of this as a very slow stumble upon, an invitation to relish something new or to revisit an old friend. Some of the people and places may be household names in the world of play and playgrounds, others not so much. I hope all will pique your interest in what they have to offer and further your own possibilities for playfulness. On this first Monday of July for the very first time, we’re having a doubleheader, doubling your screenshot pleasure. This special occasion is to honour the kick off of IPA Wales 2011 which got underway earlier today in Cardiff. 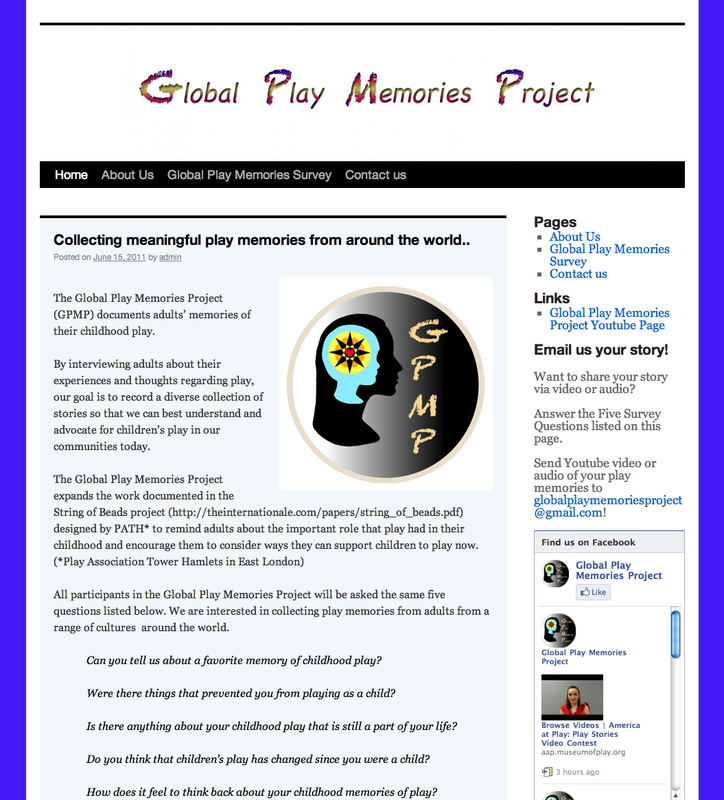 The Global Play Memories Project caught my imagination this morning as soon as I saw it bouncing around the twitterverse. What a great idea. I’m curious to see how they will share and present the finished stories. Answer the five questions and send in your responses by email, video, or audio recording. I’ve been thinking of what I’ll relate from my childhood and look forward to reading and hearing play memories from others around the world. Playing Out was also on the tweet beat this morning. I came across the site a couple of months ago. I loved the design at first sight. The concept is sound or so say my memories of play in Toronto, Canada and Greenock, Scotland in the late 60s and early 70s. Take back the streets for safe play. This UK based group is helping communities do just that one street at a time. Outdoor child-led free play on the street and around the neighbourhood. The term implies a degree of independent mobility and is usually unsupervised or semi-supervised. The name of this particular project which aims to promote and encourage a return to street play through safe, direct action. 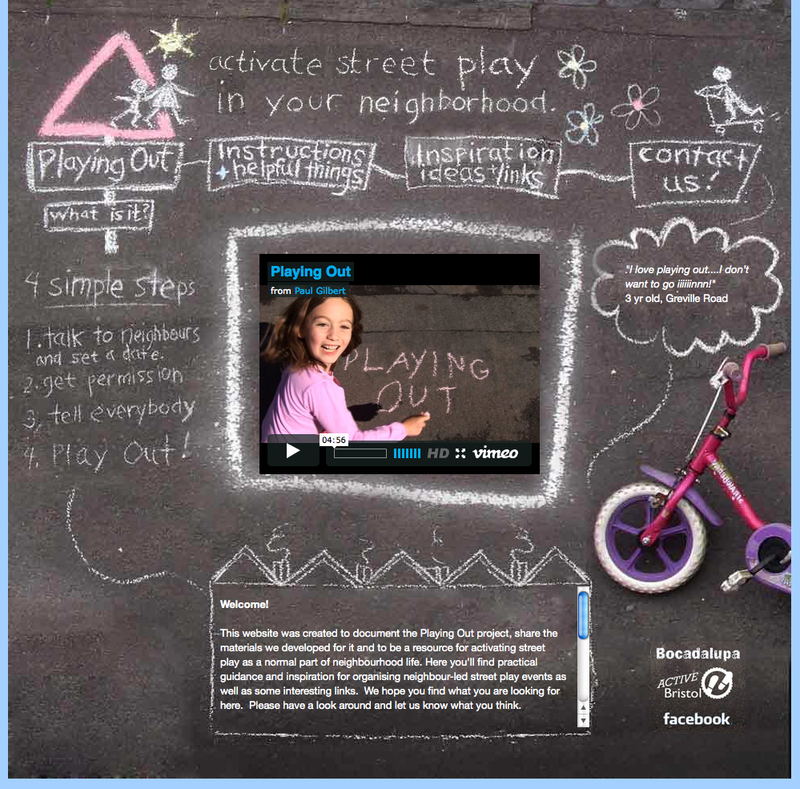 An after school, traffic-free play event that you can do on your own street. As I sign off, here’s a snapshot memory of playing out. 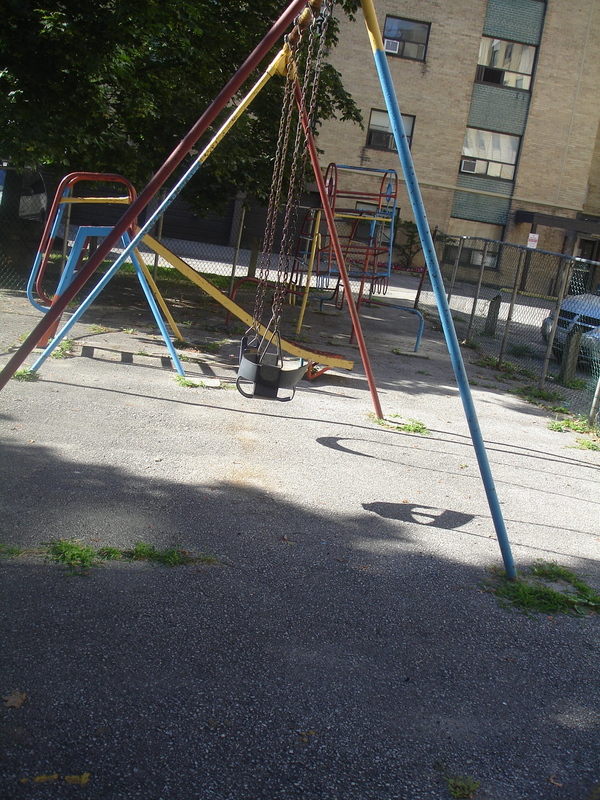 This is the playground that I have the earliest memories of at Toronto’s Bathurst and Finch intersection. This is going back nearly 50 years to the early 60s. The playground was there two years ago when I walked by and has remained virtually unchanged. This entry was posted in Global Play Memories Project, IPA Wales 2011, Play Advocacy, PlayGroundology, playgrounds, Playing Out, ScreenShot Mondays. Bookmark the permalink. Thanks for this lovely blog post. Best wishes from Cardiff! It is absolutely an awesome concept. It will be great to see what contributors have to say and share, what insights will be provided from a variety of cultures and different time periods.